PASADENA, Calif., Aug. 7, 2018 (Ecliptic PR) – Rocket Lab USA and Ecliptic Enterprises Corporation have entered into an agreement to support Rocket Lab launch of Ecliptic-managed hosted payloads on the kick stage of Rocket Lab’s Electron rockets. A Memorandum of Understanding between the two California-based firms was signed on August 1 and announced on August 7 at the 32nd annual Conference on Small Satellites, held at Utah State University in Logan, Utah August 4-9. Under the framework of this agreement, hosted payloads supplied by Ecliptic and its customers will constitute any payload launched but not separated from the kick stage once reaching orbit. Such payloads typically involve focused advanced technology and proof-of-concept demonstrations, accomplishment of selected risk-reduction objectives and/or accomplishment of focused science or business mission objectives. These payloads will be operated after the Electron’s primary mission—deploying satellites into low Earth orbit—is complete. For those missions designated by Rocket Lab to accommodate hosted payloads, Electron’s capable kick stage, proven on the Electron’s first successful launch to orbit in January this year (“Still Testing”), will serve as the platform for one to several hosted payloads per mission, providing a structure for payload mounting, power, command and telemetry functions and attitude control. Ecliptic will deliver fully integrated hosted payloads to Rocket Lab for final integration onto Electron’s kick stage. Once in orbit, Ecliptic avionics will control all hosted payload operations and related data handling; Ecliptic will also manage the end-to-end mission service and experience for its customers. Ecliptic’s U.S. domestic and international customers will be from commercial and government sectors, as well as from academia, media and non-profit arenas. Hosted payload missions can be tailored to meet the orbital inclination and lifespan requirements of customers as required. Electron will launch the hosted payloads into a wide range of low earth orbits, with inclinations ranging from approximately 39 deg. to near-polar Sun-synchronous (~90 deg.). A payload serving as a pathfinder for this hosted payload program, NABEO, a drag sail technology demonstrator designed and built by High Performance Space Structure Systems GmBH (Munich, Germany), is integrated and ready for launch on the next Electron mission (“It’s Business Time”). The first official mission of Ecliptic’s hosted payload program is scheduled for 1Q 2019 and will include a 2 kg hosted payload provided by Ecliptic and Beyond Sensors LLC (also Pasadena, California). Three additional missions are planned during 2019, each with up to 25 kg of hosted payload mass. Ecliptic is exploring additional payloads to be launched on a quarterly cadence in 2020-2022, with each mission accommodating up to 50 kg of hosted payload mass. In coming months, Ecliptic’s staff will work with the Rocket Lab team to develop necessary technical details and concept of operations for the hosted payload program, generate a User’s Guide for customers and expand the existing pipeline of payloads for the planned hosted payload launches. About Ecliptic Enterprises Corporation: Ecliptic, a privately held firm based in Pasadena, California, provides space avionics and sensor systems to commercial, civil and defense-related markets in the U.S. and abroad. Its popular RocketCam™ family of onboard video systems provides improved situational awareness on rockets and spacecraft, while its variants of experiment and payload control avionics manage complex sequencing, monitoring, data-handling and data-routing functions for a wide range of mission applications. Ecliptic also supports selected small satellite- and CubeSat-class engineering, integration, testing and operations activities. See more at www.EclipticEnterprises.com. RocketCam™ is a trademark of Ecliptic Enterprises Corporation. 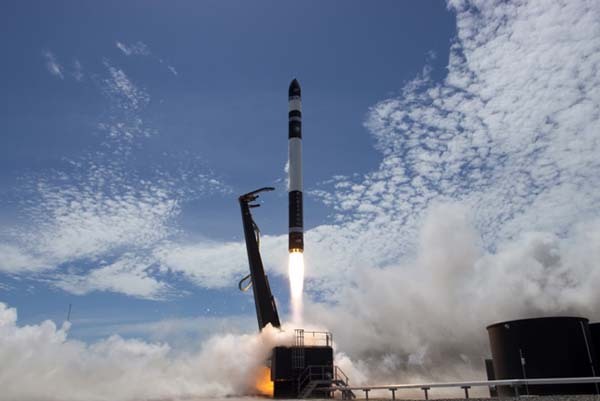 About Rocket Lab: Rocket Lab develops and launches advanced rocket technology to provide rapid and repeatable access to orbit for small satellites. Our mission is to open access to space to improve life on Earth. Rocket Lab has developed the world’s first fully carbon composite orbital launch vehicle, Electron, which is powered by 3D printed, electric pump-fed engines. Electron is a two-stage vehicle capable of delivering payloads of 150 kg to a 500 km sun-synchronous orbit. On January 21, 2018, Rocket Lab reached orbit with the launch of the Electron vehicle and successfully deployed the company’s first commercial payloads. It marked a significant milestone in eliminating commercial barriers and ushering in a new era of unprecedented access to space. Founded in 2006 by Peter Beck, Rocket Lab is headquartered in Huntington Beach, California, and is a privately funded company with investors including Khosla Ventures, Bessemer Venture Partners, DCVC (Data Collective), Lockheed Martin, Promus Ventures and K1W1. Visit them at www.rocketlabusa.com.